There are weeks when I don't feel like doing anything with my crafting. I just do stuff for half an hour here or there to make myself feel like I did something. Then there are weeks I'm driven by a certain project. This week was one of those weeks. Check out these boxers. Last weekend, I took two days to trace and cut out the pattern. On Monday night, I cut out and marked the fabric itself, which I'm still horrible at. I think the number one thing I should be improving with my sewing currently is the cutting and marking of fabric. On Tuesday night, I whipped most of it together, leaving the legs unhemmed as I had run out of thread in the correct shade. On Wednesday, before running to Helen's, I finished the leg hems, ironed it, and photographed it. I am both disappointed by and excited by my results. On one hand, these boxers are so ridiculously huge that they almost fit Paul, who is an XL in men's sizing. I cut the medium. I should have guessed that things were going south when I came to the directions for the elastic waistband and it told me to cut 36" inches. I ended up cutting the elastic three inches less than the size small suggestion and I could have cut smaller than that too. I could have made myself an extra-small of these boxers easily, if the pattern had come in that size. It did not. On the other hand, I did some gorgeous stitching and had no problems with this pattern which is for "Advanced Beginners". Look at my leg hem! My zig-zagged edge stitching was even, perfect, gorgeous. My fly top was professional looking. This was definitely my best sewing product yet, and... it doesn't fit. How disappointing. For those of you who might want to try and make this yourself because you keep hearing me gab and gab about this book, I would suggest that you really consider the sizing carefully. I'm fairly sure the size large would have fit Paul who normally wears an XL. Secondly, I read another blog post about how the elastic was hard to insert because of the fly overlap. Yeah... They were not effing kidding, folks. I spent most of my sewing night trying to insert that bloody elastic. I finally cut a hole in my fabric to pull the elastic out because I knew I was going to stitch the x'ed out square over the fly anyway. Be warned. I suspect if I ever made boxers again, I'd just go buy a simple Simplicity pattern or something. I do think it is time for my to (1) review Sew Everything Workshop since I have sewn three different patterns from it, and (2) make something from one of the patterns I've bought rather than continuing my book sewing trend. Next step is a Sew Easy Simplicity pattern. I don't know when I'll get to it since I'm kind of in love with cross-stitch again, but I'll get around to it. 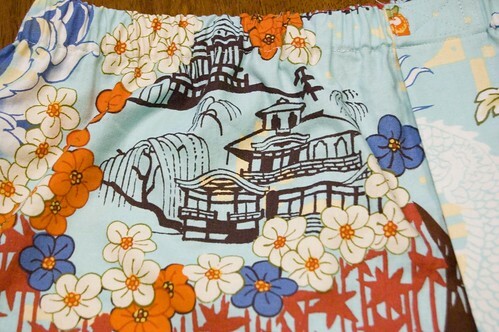 Oh, if you want a men's Medium pair of boxers in an outrageously awesome Chinoiserie cotton, let me know. I've got a pair that is very very gently used laying around. They're pretty good for lounging too. So, it is no surprise that I love to read textile blogs, right? 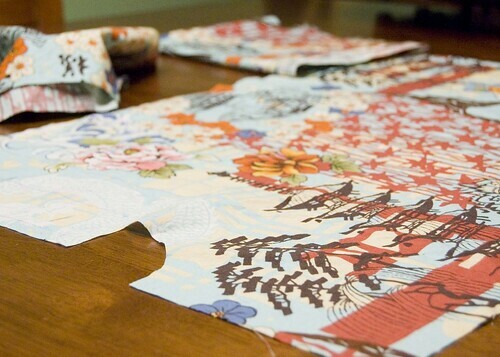 I'm obsessed with listening, reading, doing... so long as it is related to textile crafts. 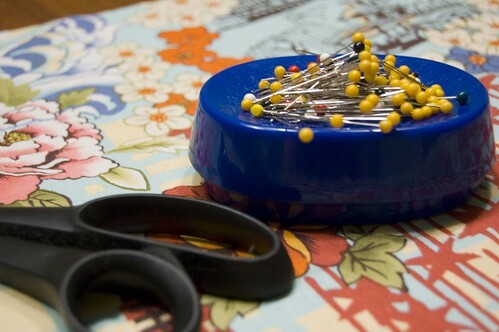 Anyway, one of the blogs I read is Sew, Mama, Sew. Every Christmas, they do a gigantic giveaway contest in which they give away stuff to bloggers who do a giveaway on a certain day. This year, they decided to do a mid-year giveaway! They must have links to at least a few hundred giveaways, including finished goods and materials to make things! Go check them out, or at least browse. I've already added five new blogs to my feedreader. I don't sign up for every giveaway, but those where I like the crafter's blogging and the thing being given away. Hopefully, I'll have pictures of my finished boxers soon. I have everything done besides the leg hems. I have no idea if, when sewn up, the pattern's "up" will be the same as the boxers' "up", if you know what I mean. 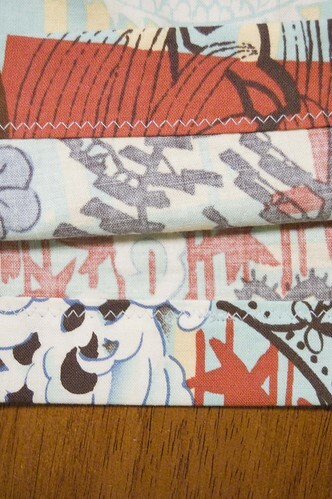 The fabric is from Joann and it is part of Alexander Henry Fabrics collection from 2006. Hopefully, by next week, I'll have some pictures of a finished project to show you, and possibly some updates on my other projects, and a picture of my beautifully wound Schaefer Anne yarn. Unlike the Socks That Rocks fiasco, things are already looking good. The yarn cake, newly wound, was gorgeous rather than frightening. Thanks, Christy, for helping me with that. I was going to skip a post this week because I was just out of it. I was tired, grumpy, allergy ridden, and tired. This led to me not doing much at all that shows. I mean, I knit a little on my scarf, and I cross-stitched, and I even finished that cloth book I showed you in my last post, but nothing exciting happened. Then, darling Christy came through with her Knit Picks order. In the recent past, she asked Helen and me if we would like to get anything from Knit Picks so we could all get free shipping from one package. I decided to go with an extra long cabled sock needle for trying the Magic Loop again, and two skeins of Gloss Sock Yarn. 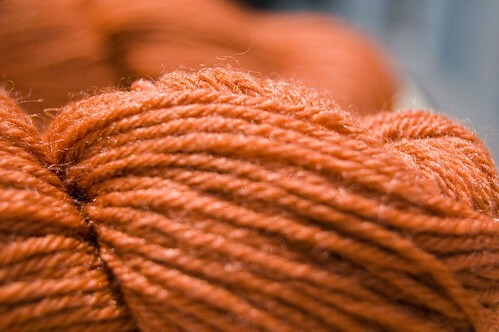 This yarn has silk in it. It's very pretty when you look at it close up. Now, I just need to find a good pattern for this yarn. Perhaps the Bella Catena Italiana? I'm not doing much crafting wise, recently, but I still want to blog. Since I'm not listening to any new podcasts (as I'm trying to listen to all the back episodes of Stash and Burn, as well as Knitmore Girls), I thought I'd share several cool links, et cetera. Feel free to ignore this post, or to read it. First, my friend Sophy has just bought a house. Congrats, Sophy! However, even though she's probably as busy as all get out, she has not yet stopped crafting. In fact, she took the time to create an awesome Star Trek costume for the premiere! By the way, if you haven't, go see the movie. It's not deep, but it is fun. Second, I love this video. I love the music in the video. I love that these are not model helicopters. Lastly, I love the new nail polish shade, Mermaid to Order, from Sephora. I tried it on today at Sephora, and I fell in love with it. I'm definitely going to buy it, and if I like wearing it, I have a feeling I might stock up on another bottle. I think we already know how this turned out. 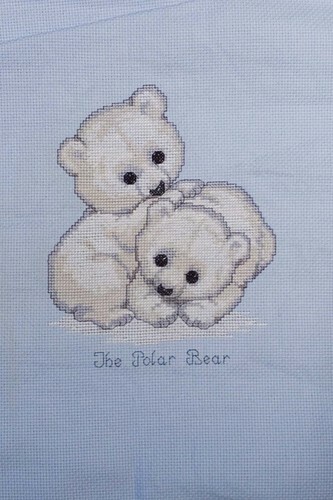 Now, I did cross-stitch a tiny bit that night, but ten or fifteen minutes of cross-stitch doesn't really count, does it? By the way, thank you to everyone who so kindly complimented my socks. I'm a little defensive when people do so because I believe they look hideous in my mind, and I'm not taking the compliments. I'm sorry. They are very soft and very warm, and if I can find some colorways that I like, I will be buying more of the yarn. I have talked of hating crazy varigations in the past, but I'm a hypocrite. 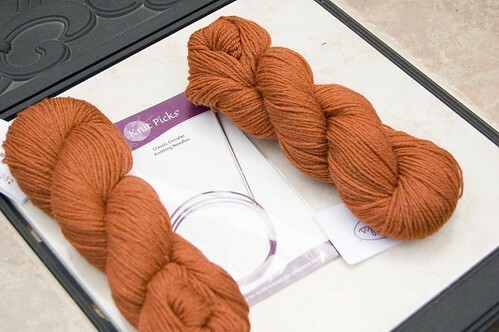 While I'll always believe that a colorway like Space Dust will look like clown puke when knitted up, I'll happily buy Koi Koi or any other pinkish/bluish colorway. I believe it was Christy, my future sister-in-law, that said to me that I liked yarns that looked like unicorns had thrown up on them. Sigh. I didn't even craft on Sunday. On the weekend itself, I might have done another thread or two of cross-stitch, but nothing noticable. 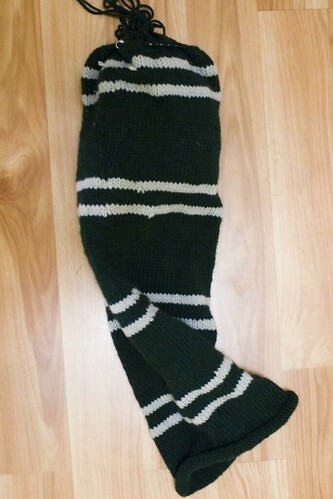 I knit about two rounds of my Slytherin scarf. Okay, lie, I finished one of the gray groups, and started on my green rounds. I'd be sad at the slow progress if it weren't for the fact that I haven't worked on it at all for months! I might have spent a few minutes cross-stitching this night. I went to Helen's, ostensibly to knit. Then, her three foster kittens brought me low. It was horrible! I was knitting while watching The Tudors and then these three kittens sat on me and my knitting. I then proceeded to pet them because KITTENS. So, I was going to let this whole entry going to go pictureless, but I think we all know what I think about blogs without photos. 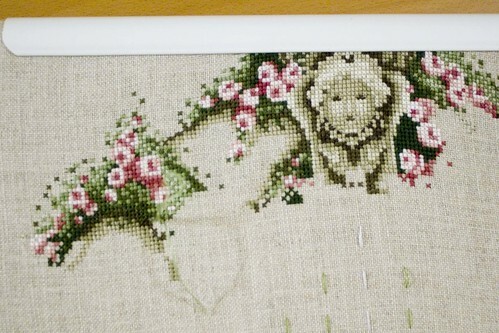 Here is a picture of The Rose of Sharon cross-stitch. Hours and hours of work to show you that I added about two square inches of work from the last time I photographed it. Perhaps less. Next time, I'm just going to link to other people's WIPs and pretend that I did a lot more. I also have an updated photo of the scarf! In case you're curious as to why it is laying so oddly, I keep the actual yarn stuffed into the center of the scarf to prevent my kitties from taking it out and carrying it around my house. Since I spent part of the weekend simply rewinding my silver yarn again, I clearly needed to take action. So, are you asking if I have plans for the upcoming week? Yes, I do. I'm not giving up on my plans. I think I have started alternating projects to good effect, but I do need to be a little less stringent about my planning. My plans are thus: two days of sewing, two days of knitting, one day of cross-stitch, weekends are free as usual. Ideally, I'd also like to start Nathan's matching ugly socks. I'm still working on leaving my computer a bit earlier, though I've failed tonight! I do still want to get my cloth book done for my cousin's baby, but I'm itching to start another garment with my sewing. I wasn't going to do the Flouncy Tank Top project from the book Sew Everything Workshop , but then I saw a gorgeous version that made me drool. 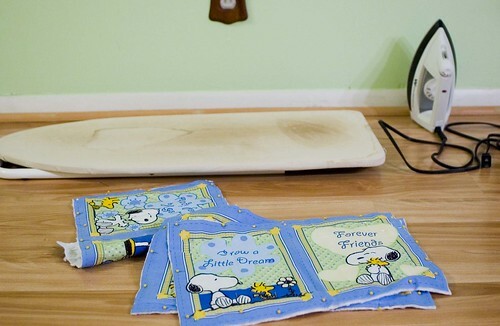 Mmm, I love when I find inspiring blogs or photos. Lastly, thank you to the person who came to my blog and followed my links to Amazon and made purchases. It was nice of you and I made a whole dollar! I was stunned when Amazon told me it had happened, actually, and then I told myself that I'd buy a Simplicity pattern to make for my blog! I love the dollar pattern sales at Joann!